Our installations team recently completed a Splashback project at a customer’s home in Cobham. We supplied seven pieces of 6mm low iron toughened glass in total, ranging from very large (2.8m x 1.1m) to thin slivers (1.2m x 53mm) of glass. We used a combination of shaped glass and glass with radius corners to accommodate the unusual shapes of the kitchen wall and furniture. The result? A durable, safe and extremely low maintenance new-look kitchen. Back painting the splashback twice in white, and finishing with a final backing coat in light grey helped to stop the adhesive showing through the splashback in sunlight. The grey backing wont affect the customers splashback and is a far superior quality solution than foil backing, which is used by many glazing installers. Finally, our fitters used a hardening compound to protect the customers chosen colour. Glass splashbacks are naturally smooth and easy to clean. Unlike traditional kitchen tiles, splashbacks dont have joins and grout which not only harbour bacteria, but also tarnish and stain with age. This means that splashbacks are lower maintenance in the long-term and stay looking like-new for years to come. How long does it take to complete splashback installation? As the customer required other electrical works completed at the same time, we recommended our electrician, Tim, and arranged for all the work to be completed in the same day. 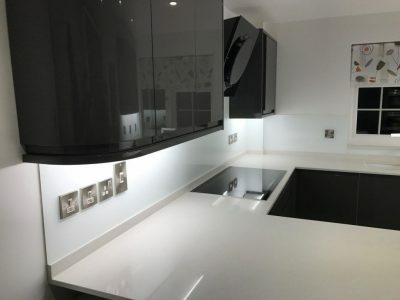 With the whole process taking three weeks from survey to completion, the customer received a fantastic looking, contemporary, functional and hassle-free kitchen in very little time. Would you like more information about our bespoke glass Splashbacks? Visit our Glass Splashbacks page or contact our team now on 01932 344 415.